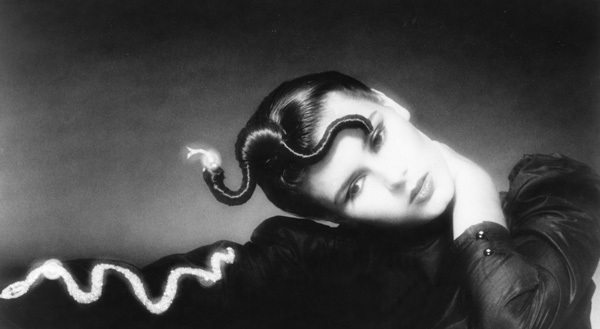 Home » Posts Tagged "Snake Charmer"
Sassooning for Evening, with original hair accessories designed by Avram, Vidal Sassoon, New York, 1979.
through hair sleekly knotted asymmetrically on top, a new dimension for false hair. as simple, pure and perfect as Sassooning for day. Avram had a unique awareness of fashion as well as a degree in Fine Arts from the School of the Museum of Fine Arts in Boston. schools of art of the early 20th century. wife, and probably others. Avram created this snake charmer look on the model and Dali loved it! snake charmer in a hair-related exhibition.